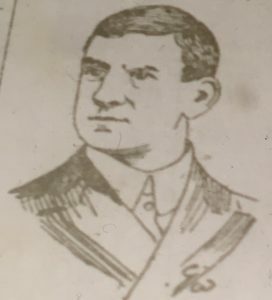 John Wilkie first joined Partick Thistle in 1894 from Summerton Athletic where he first teamed up with John Campbell as Thistle’s left wing partnership in the Second Division. He left to join Blackburn Rovers in September 1895 where he was eventually joined by Campbell and John Proudfoot. After a three year spell in England he and Campbell returned to play at Ibrox for Rangers for five seasons (with a period on loan at Middlesbrough) before re-signing for Thistle in 1903-04. Following a successful two seasons at Meadowside he joined Hibernian, and resumed his relationship with John Campbell. The Scottish Weekly Record profiled John on 23 September 1905. Since first joining the senior ranks, and he was then a boy, John Wilkie, who next season will be seen in the green jersey of the Edinburgh Hibernians, has experienced much football on both sides of the Border. His early football days were spent with a Partick junior combination, and it was but natural that, when he decided to become a senior, his first club should be the Partick Thistle. There with his partner, John Campbell – the pair then being popularly known as “The Babes” – he played many fine games at inside left, till latterly his fame, along with that of Campbell’s, crossed the Border, and the pair were induced to go to Blackburn Rovers. After a sojourn there Wilkie again returned to the Rangers, but for the past two seasons has played with Partick. Now he rejoins his old comrade again in the Hibs, where he is certain to prove his worth. Wilkie can play the inside game on either wing; has a grand command over the ball; and when in the mood is a splendid forward. His spell at Hibernian in 1905-06 was a disappointment. He was suspended and transfer listed by Hibs in October, allegedly for indiscipline at training, and eventually joined Ayr Parkhouse.